Check out all the action from Monday night's game against the Warriors in Oakland. 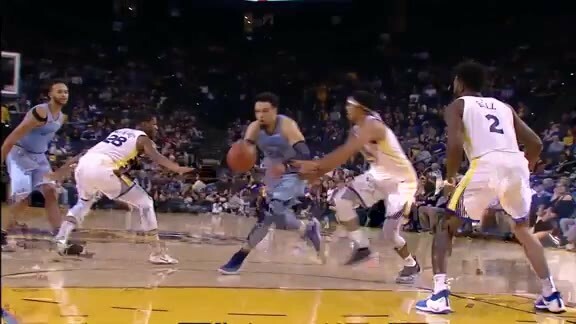 Dillon Brooks cuts through the lane and finishes at the rim through contact. Brooks leads the way in scoring for the Grizzlies dropping 18 points off the bench in 24 minutes of action. 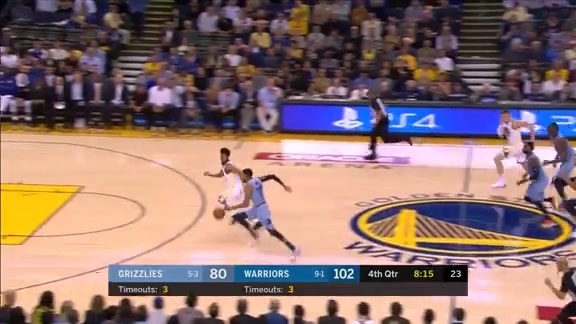 Mike Conley dashes to the rim and lays the ball in high off the glass. Gasol finds Jaren Jackson Jr. with a mismatch down low for a two-handed slam. 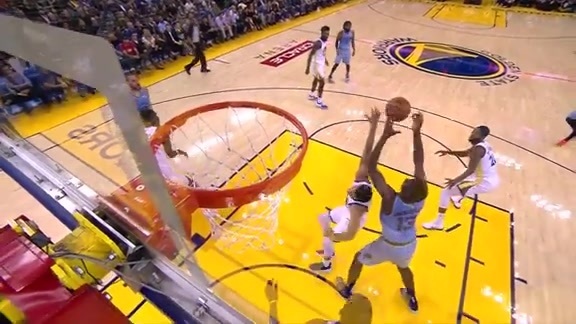 Jackson records three blocks in the first half Monday night against the Warriors, including back to back swats at the rim on guard Quinn Cook. 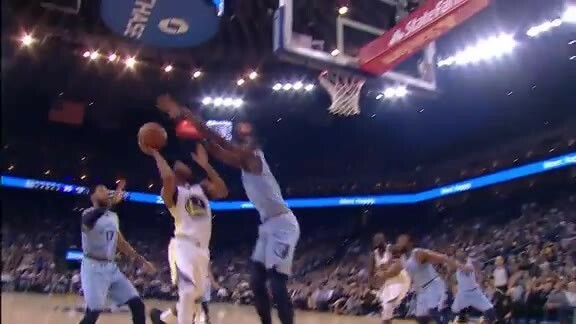 Marc Gasol and Shelvin Mack connect down low for a back door bucket. Golden State outrebounded Memphis 46-30. The Warriors used a 16-4 run from 10:07 to 4:43 (5:24 span) in the quarter to help take a 92-73 lead heading into the fourth. 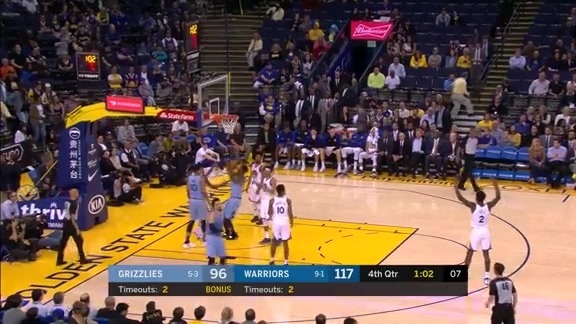 The Memphis Grizzlies were defeated by the Golden State Warriors 117-101 on Monday night at Oracle Arena. The Grizzlies drop to 5-4 on the season and are 2-4 on the road. The opening quarter was a back-and-forth affair that featured nine lead changes. Memphis scored 10 points off five Warriors turnovers in the quarter. Dillon Brooks made 4-of-6 shots (2-4 3PT) for 11 points to help the Grizzlies go up 31-29 at the end of the period. The Grizzlies assisted on 10 of their 12 baskets in the quarter. Memphis shot 11-of-22 (.500) from the floor, while the defense held Golden State to 9-of-20 shooting (.450), in the second quarter. The Grizzlies also blocked six shots in the second quarter alone, tying the season-high for blocks in a game. With 2.9 seconds left before halftime, Klay Thompson hit a three-pointer to tie the game at 58-58 at the break. The Grizzlies tied a season-high for first-half assists with 19. The Grizzlies had success attacking the paint, scoring 32 points in the lane compared to 14 from the Warriors in the half. Memphis made 7-of-8 (.875) free throws while Golden State went a perfect 16-of-16 (1.000) from the line during the first half. 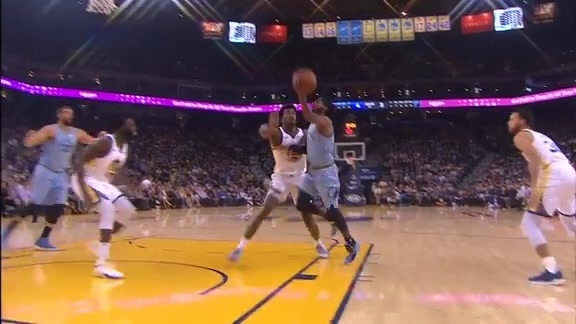 Golden State’s offense found its footing in the third quarter, outscoring Memphis 34-15. The Warriors used a 16-4 run from 10:07 to 4:43 (5:24 span) in the quarter to help take a 92-73 lead heading into the fourth. The two-time defending champions shot 13-of-23 (.565) in the period while Memphis made just 5-of-19 (.263). Memphis outscored Golden State 28-25 in the fourth quarter, shooting 10-for-19 (.526), but the deficit was too much to overcome. 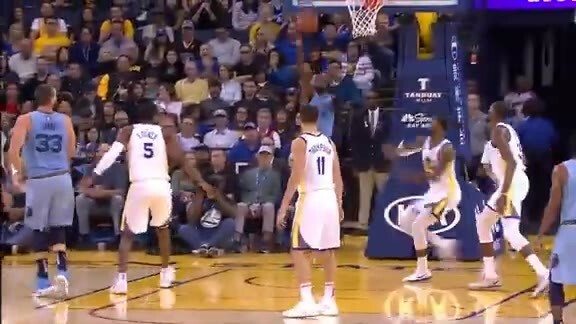 The Warriors made 41-of-81 (.506) shots from the floor, including 13-of-24 three-pointers, while the Grizzlies finished shooting 38-of-83 (.458) on field goals, but only made 9-of-27 (.333) threes. The Warriors also went 22-for-23 (.957) from the free throw line, compared to the Grizzlies shooting 16-for-21 (.762) from the charity stripe. Golden State outrebounded Memphis 46-30. Both teams moved the ball well, as the Grizzlies had 31 assists and the Warriors had 29. The Grizzlies outscored the Warriors in the paint 52-36. Memphis blocked a season-high eight shots. Brooks led Memphis with 18 points off the bench. Jaren Jackson Jr. scored 15 points to go with six rebounds and a career-high five blocks. Garrett Temple added 13 points while Shelvin Mack scored 13. Marc Gasol approached a triple-double, pulling down a game-high 10 rebounds and dishing out nine assists while scoring eight points. Thompson led all scorers with 27 points. Kevin Durant added 22 points and six assists. Stephen Curry scored 19 while handing out seven assists. Quinn Cook scored 13 off the bench on 4-of-5 three-pointers, all in the fourth quarter. Alfonzo McKinnie finished with 13 points. The Grizzlies return to Memphis on Wednesday, November 7 to host the Denver Nuggets in FedExForum at 7 p.m. CT. Tune in to FOX Sports Southeast presented by Pinnacle Financial Partners or listen on 92.9 FM ESPN to follow the action. 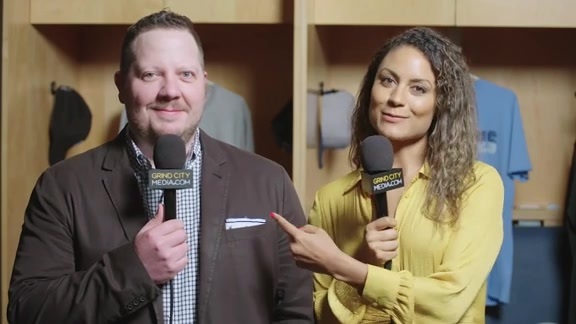 Fans who want to support the Memphis Grizzlies and purchase 2018-19 Season Tickets, 22-, 10-Game and Flex Packs can do so now by calling (901) 888-HOOP or going online to grizzlies.com/tickets. 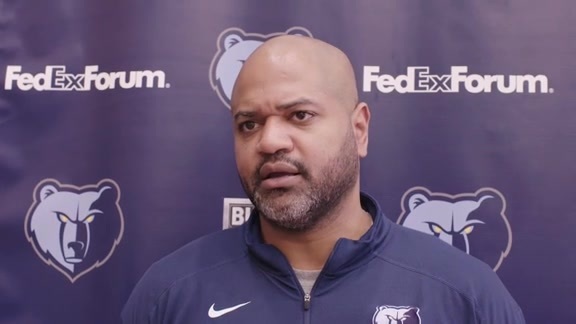 Single-game tickets are available for purchase at the FedExForum Box Office, all Ticketmaster locations, ticketmaster.com, online at grizzlies.com/tickets or by calling 1-800-4NBA-TIX. 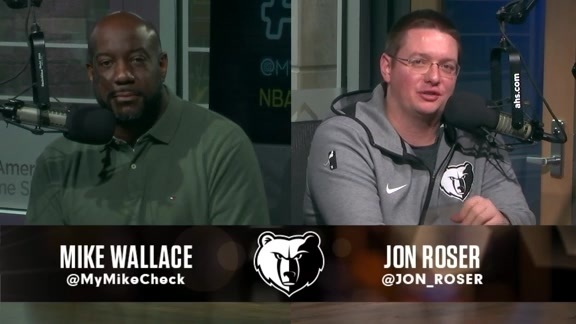 For more information on the Grizzlies, ‘like’ Memphis Grizzlies on Facebook or follow on Twitter and Instagram (@memgrizz). 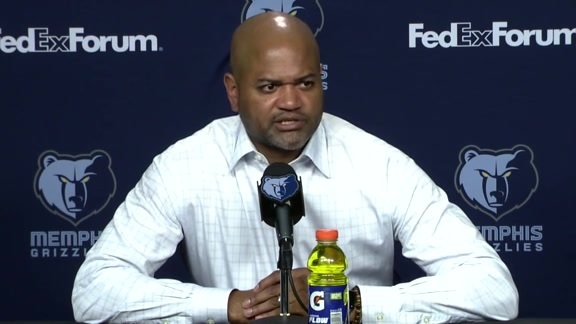 The Grizzlies have committed fewer turnovers than opponents in each of their initial nine games. Memphis blocked a season-high eight shots.